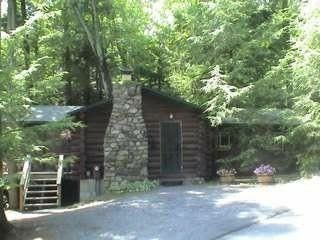 Charming, expanded log cabin overlooking Lake George. Perched on hill 100' from beach with lake-view, this renovated cabin is in a wooded, 70 acre private homeowners association. Our private steps lead down to common lawn area with wooden swing-set/play gym, volleyball net and ping-pong table. The fire-pit at the beach is great for cranking up fires on summer evenings under the stars. The private sandy beach has chairs and chaise lounges available for your use; the sandy-bottom swimming area is roped-off, with a gently graduated depth to a floating swim raft. Cabin's Main Level features: pine floors & knotty pine walls; 2 prvt bedrooms; kitchen; full bath; living room with solar powered skylight; dining room with sliding glass doors to a deck with lake view, Weber propane grill & picnic table that seats 8. Cabin's Lower Level features: tile & wood floors; knotty pine walls & ceilings; 2 bedrooms (1 prvt MBR; 2 open BR's off main room); full bath; entertainment area with rattan couch and chairs, Smart TV and Wireless internet service (WiFi), DVD/VCR, and lake view through sliding glass doors to patio. **NOTE: Main and Lower Levels each have their own separate entrances, and are not connected internally. Located in a quiet, wooded enclave merely one mile north of Bolton Landing's shops, restaurants and the famous Sagamore Hotel and Golf Course. Lake George Village and its shops, amusement parks and arcades are only 15 minutes away and the new Adirondack Eco-Adventure Park is a 5-minute drive. toilet, combination tub/shower, Pedestal sink. Approximately 100' from beach and lake. New Smart TV enabling guests to utilize their own accounts and mobile access to stream movies from Netflix, Hulu, etc. Large wooden deck with chairs and zero-gravity chaise lounges. Main Level: MBR-1 queen; 2nd BR- 1 twin bunk bed. Lower Level: Private MBR-1 queen; one 'open' BR off main room-1 double; and one 'open area' between Private MBR and main room with one twin bunk bed. DVR-TV-WIRELESS INTERNET with DVD/VCR player; dishes and glassware; towels and linens provided weekly. CDs, games, movies and books provided. Swing-set/play gym, volleyball court, ping-pong table. The perfect family location & Best Hosts! This was our first time to Lake George and we could not have picked a more perfect location and home to rent! The town of Bolton Landing was all you need in a small lakeside town... enough restaurants and shops to walk around with the family. There was no need for us to visit Lake George Village at all as it is very tourist-y and the food is subpar. Renting from Andy & Joan was the best thing that could have happened to us as well! They are undeniably the best VRBO hosts we have come across! Just wonderful people. Aside from the endless list of suggested spots to hit, they made sure we had everything we would need to stay comfortably. This slice of heaven is beautiful, clean and has all the right feels for a quiet family getaway. We loved eating our meals on the spacious deck overlooking the beach and lake. We brought some of our kids favorite games, but they had card games and puzzles as well. It was so wonderful to have a beach and playground right in front of us for the kids! When they weren't jumping off the docks they were no more than 50 feet from us at the playground or in the sand. There was no need for us to bring chairs or toys - the association has a ping pong table on the beach along with volleyball, badmitton and paddle ball available right there! Some of our favorite memories are our s'mores at the campfire! Again the proximity was perfect, just a few steps from the house to the beach and we were under the stars signing around the fire! Do NOT be scared off by the no A/C!!!! trust me - us city folks were a bit worried that we overlooked that detail... but it was soo not necessary! The house was perfectly comfortable in mid-August. As I mentioned before Andy and Joan had a ton of suggestions for us. From where to eat, to who has live music, to what beers are on tap here & there, to what meat is the best to barbecue, to where to rent boats etc., to what roads to take (and songs to play along the way!). And not one suggestion was a fail. We got to drive around the area a bit to follow some ideas and we loved the drive as well. Thank you Christina & Larry for being such wonderful guests and caring for our home as if it were your own. We were delighted to have been able to provide you and your children with the opportunity to share the love of Lake George that we also experienced with our children as a young family, and continue to enjoy to this day! We look forward to adding your family to the roster of guests that return return for family vacations, year after year! Thanks again for sharing your positive experience at our home. It really is so rewarding for us to have that feedback from our guests. We had a wonderful time at the Schiffer residence in Bolton Landing. There was plenty of room for our family of six. Our two older kids enjoyed having what felt to them like their own apartment since the lower level has its own entrance. We enjoyed dinners on the deck overlooking the lake, fires at night by the beach with neighbors, and the kids met friends they could swim with in the lake during the day. Plenty of hiking and other outdoor activities nearby. Would love to go again..
Nice cabin for multiple family vacation/renunion. Great location, easily accessible to beach, beautiful view of lake from deck. Provided convienient place for outdoor barbecues utilizing the capable grill and accessibility to kitchen. Many nice amenities. Another great stay at the Schiffer cabin! This was our 3rd year staying here, and everything continued to be wonderful: a comfortable well-maintained rustic cabin, directly uphill from the playground and beach area, and a 2 mile drive to the town of Bolton for groceries, restaurants, etc. The kids (1/3/5 years) continued to love it, and we're looking forward to our next trip to the cabin this coming July. Thanks Andy and Joan for continuing to make your cabin available while you're not using it! Marc and Andrea, it’s been our pleasure to have you and your family return year after year as our guests! Thank you for your kind words....we’re glad you enjoy our home as much as we do. Looking forward to continuing the tradition! Another great stay! We went last year and had a wonderful week, so it was an easy decision to come back for another great week. Everything was wonderful again, and there were some nice new renovations to the house: new lighting, ceiling fans, auto-retractable skylight. A rustic yet modern and cozy cabin located in a perfect location with wonderful amenties. The beach, playground, swim dock, house, etc. were all perfect for everybody - our 2- and 4-year kids had a blast. Thanks again Andy and Joan! At the edge of the beach is a fire-pit, perfect for cranking up a roaring fire under the stars, making S'mores and watching the celestial fireworks! If you're lucky you might catch a glimpse of the Northern Lights! Located one mile north of the historic Sagamore Hotel and Golf Course, and Bolton Landing's many shops, restaurants and marinas. Additionally, we are merely 15 minutes away from Lake George Village with its abundance of shops, restaurants and arcades, including miniature golf and The Great Escape Amusement Park. Lake George is 32-miles long, 3-miles wide and is a spring-fed wonder of nature often referred to as 'The Queen of the American Lakes'. Located only one hour north of Albany via I-87, it is merely 3.5 hours north of New York City.